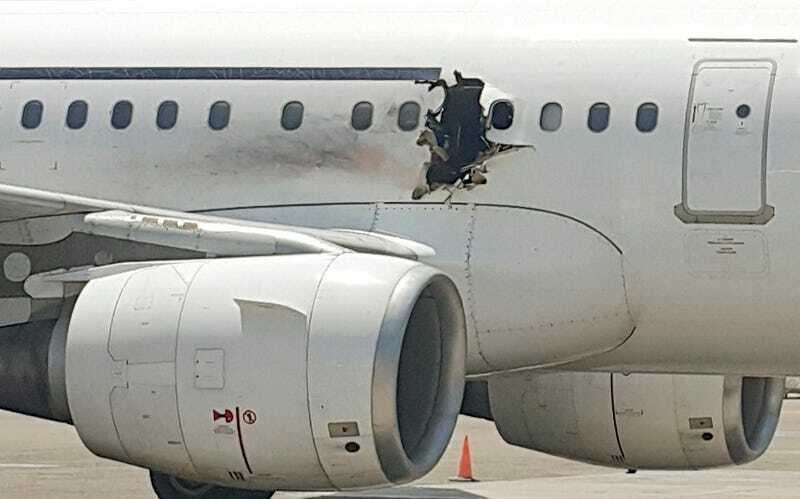 The alleged terrorist who blew himself up on a Daallo Airlines plane last week hid his bomb inside a laptop, according to Somali officials. The man, identified as 55-year-old Abdullahi Abdisalam Borle, is believed to have been handed the laptop by two men posing as airline workers at the Mogadishu airport. The explosion in midair on the flight from Somalia to Djibouti caused Borle to be sucked out of the plane and injured two other passengers. The plane made a successful emergency landing. The Wall Street Journal reports that more than twenty men believed to be connected to the attack have so far been arrested. The two men posing as airline workers were identified on security camera footage in the Somali airport and were seen handing Borle a package. “The suspects are cooperating, and we’re getting good information. We’re going to get to the bottom of it as soon as possible,” Somali government spokesperson Abdisalam Aato told the Wall Street Journal today. Some believe that the terrorist act was connected to an Islamic group known as al-Shabaab. The group is affiliated with Al Qaeda and aims to overthrow the Somali government. Correction: This article originally identified the airline in question as Turkish Airlines. The suicide bomber had originally booked a Turkish Airlines ticket but that flight was canceled and he boarded a Daallo Airlines flight. Gizmodo regrets the error.